This week’s blog gives insight to how my experience as a patient helped me come to terms with most appropriate ways of communicating with patients in order to help diminish patient’s anxiety. Yeah, that’s me…..In 2013, I underwent a major abdominal surgical procedure which made me debilitated and I was out of work for just over a period of 5 months. 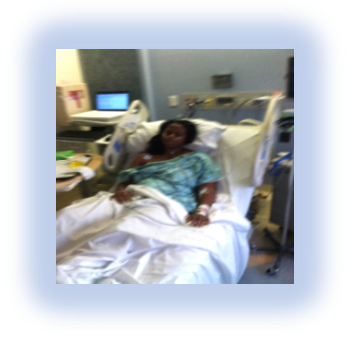 During my period of recovery, this experience made me become very dependent on my family and healthcare providers. In addition to visits to my primary care doctor, I also had to visit other specialists as cardiologist, Gynecologist, urologist and general surgeons to complete what seemed to me at that time like series of never ending medical examinations, tests, scans, and other diagnostic studies. This process created quite a great deal of anxiety for me and as a patient, I found myself frequently grappling with several levels of anxiety and physical pain which ultimately started to affect my daily mood and outlook. I must add that it was a humbling experience as it dawned on me that many, if not all patients in the healthcare system do experience different levels of anxiety due to the feeling of not knowing the outcome to any given clinical situation. “The unknown” can create feelings of crippling fear for some patients and for others, can create moments of doubt, confusion, awkwardness (sometimes evidenced by misplaced smiles and laughter), irritation, and even bitterness. These underlying emotions and anxieties can ultimately manifest as several kinds of patient behaviors and attitudes during a clinical visit. Some behaviors may be perceived by a clinician as overly curious, rude, dismissive, absurd, or downright bizarre. As I intently studied the word of God during my period of recovery, the idea of making this knowledge known to everyone (including all patients and my colleagues in healthcare) began to take shape in my mind. I became very committed to helping others understand the effects of patient attitudes on establishing effective communication patterns and forming productive clinician-patient relationships. Thus, the idea for the book, “Simple Tips to Developing A Productive Clinician-Patient Relationship” was conceived. In this book, I also identified practical tips for clinicians to help allay patient anxieties during clinical visits. This is because given my 25 years of interacting with patients of diverse backgrounds and my experience as a patient, I recognized several communication styles that help reduce patient’s apprehensions, resulting in more efficient communication regardless of the patient’s attitude or personality. To make it a reader friendly book, I added some humorous dialogues and cartoon illustrations of clinician-patient scenarios. One Response to When the Clinician becomes a Patient…. All through the 21 chapters of Simple Tips to Developing a Productive Clinician-Patient Relationship, author Nonye leaves no reader in doubt as to her knowledge and competence on the issue of this age-long communication gap between the patient and his or her doctor. The author has experienced both sides of the clinician-patient world of interaction. Her understanding of the problem, as well as her useful illustrations and competence in prescribing a viable solution, seem to me to come from her insider knowledge and experience.I believe both patients and health professionals everywhere in the world will benefit from reading this book–I have–as it provides the techniques required to attain optimal and mutually beneficial relationship between clinicians on one side and patients on the other.